Published: April 22, 2016 at 07:51 a.m. Updated: April 22, 2016 at 08:11 a.m. 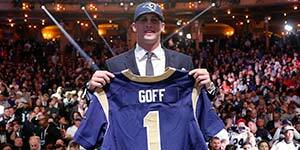 The Tennessee Titans and Cleveland Browns each received massive hauls for trading away the top two picks in next week's NFL draft so their counterparts, Rams and Eagles, respectively, could draft an unproven quarterback. If teams are willing to give up multiple first-round picks and a bushel of high selections for an unknown passer, what sort of treasure trove might be waiting for a team willing to dangle a proven franchise quarterback? It was the question posed to Detroit Lions general manager Bob Quinn, who was asked Thursday if he ever allows himself to think about the haul he could receive if he decided to trade Matthew Stafford. Quinn shot down the conception of that idea. "I haven't thought about that and I have no interest in trading Matthew," Quinn said, via the Detroit Free Press. Your initial reaction might be: What kind of question is that? What is Quinn supposed to say? Of course you don't trade a franchise quarterback who is just 28 years old, theoretically entering his prime and just came off the best eight-game stretch in franchise history. OF COURSE, you don't do that. Teams spend years -- decades, even -- searching for a franchise quarterback. To trade one away, especially with zero potential replacement, would look insane to an insane person. Yet, early last season, many in Detroit wanted to stuff Stafford in a crate and ship him out to sea when the Lions started 1-7. At that time, asking about a Stafford trade might not have sounded so ludicrous for a team in position to perhaps get the No. 1 overall pick. But that was BJBC -- Before Jim Bob Cooter. After Cooter took over, Stafford lit the field afire. No, Quinn wouldn't trade a starting quarterback, but asking the question isn't crazy. Sometimes it leads to a wishy washy answer -- like the "never say never" reply from Trent Baalke on a possible Colin Kaepernick trade -- that in itself gives us insight into what a GM actually thinks about his quarterback. In this case, Quinn's quick, blunt reply said plenty.